Donna Kouri is a school librarian in Naperville, Illinois. She uses Skype to connect her students with authors and classrooms. I invited Donna on Watch. Connect. Read. to share about the time her lucky fourth- and fifth-grade students Skyped with author R.J. Palacio. I wrote the words in red, and Donna wrote the words in black. Thank you, Donna! 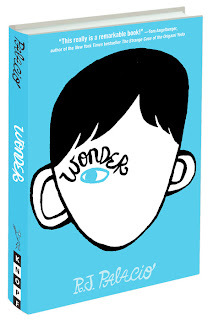 *R.J. Palacio’s Wonder is a life-changing book that is an integral part of any classroom, school, or personal library. *R.J. told my students that the inspiration for Wonder came from an actual experience she had where she felt as though she may have unintentionally made a child with facial deformities feel uncomfortable. She felt so awful about the experience that she wrote Wonder. *My students learned compassion from reading Wonder. They easily identified with the different perspectives and, I think, also realized what their perspective would be and how it would be interpreted - both positively and negatively. They easily understood the message about being judged and wanting to fit in. *We prepared for R.J.’s Skype session by viewing the book trailer, reading Wonder, and writing questions to ask her. *I like connecting with authors on Skype because it allows students to connect with the author and builds excitement for reading. They see authors as celebrities and it means a lot when one is willing to spend time connecting with a classroom. Students are in awe. *You should read Wonder if you are looking for a story that will have an impact after the last word is read and that will help create a kinder climate. *The Choose Kind campaign is a wonderful way to keep the message of Wonder alive and to allow students to share their stories. Click here to sign the Choose Kind pledge. *Mr. Schu, you should have asked me about... how kind and genuine R.J. was with the students. They could tell she was interested in them and sat glued to her every word. Borrow Wonder from your school or public library. Whenever possible, please support independent bookshops.